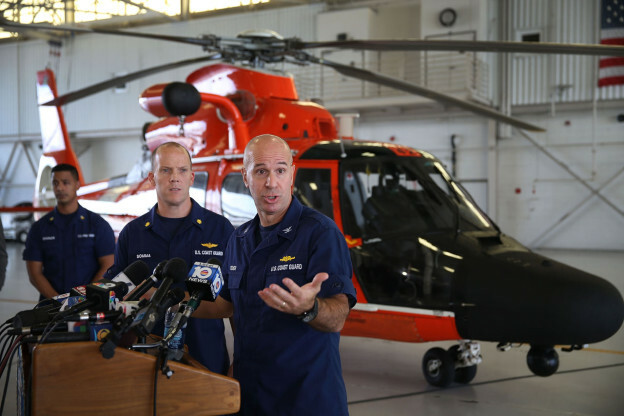 U.S. Coast Guard Captain Mark Fedor speaks to the media, at U.S. Coast Guard Station Miami, about the sinking of the 790-foot container ship El Faro on October 5, 2015 in Opa Locka, Florida. The Coast Guard has concluded that the ship most likely sank after encountering Hurricane Joaquin last Thursday, but Coast Guard cutters and aircraft and a U.S. Navy plane continued searching for the 33 missing crew members. The U.S. Coast Guard says El Faro, the U.S.-based cargo ship that has been missing for the past five days, did in fact sink off the Bahamas during Hurricane Joaquin. A search and rescue crew spotted one body amid the debris, and the search continues for 32 other crew members. Here & Now’s Robin Young speaks with Captain Joseph Murphy, an instructor at Massachusetts Maritime Academy and a former commercial ship captain.